I think the comments about UB are missing the point. Seven has had a woeful history on Sunday night ratings. 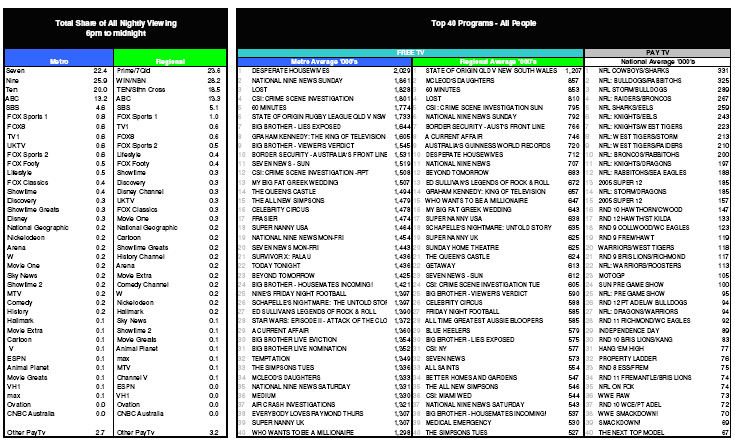 UB has consistently rated around 1.2-1.4million for Seven in a timeslot that they have always struggled in against the likes of 60 minutes and Big Brother and Idol. I think Seven would be extremely happy that the show is still pulling solid figures – and the demographics for it are still very solid. UB is many things but its not a sitcom. The through-line of character arcs means it doesn’t adhere to sitcom rules where characters never learn and move on. Gilligan was always stuck on the island. Sharon never rises above being Kim’s foil. Maxwell Smart was always hapless. But in Betty characters do carry on their lessons learned. maybe Sunday isnt the right day for it…would thursdays work better,as it does for ABC in the US? I actually love them both … not a dud at all! Golly 7s beautiful sunday needs a facelift! 60 minutes is killing ugly betty and rightfully so as ub is truly woeful. i really feel for seven as their two big US hopes for this year,ugly betty & heroes,are slowly turning into duds after such promising starts.